Very nice machine. Thank you for the patch! i believe it's not just minor tweaks, since theres a lot code changes in i430vx. please don't compare PCem with PCem-X or it's unofficial forks. I think that this (or the seemingly identical 316SX) is the first PC I ever used. For the record, this system has an OTI-067 onboard, uses an ACC Micro 2036 chipset and a UM82C862F SuperIO chip, none of which are currently emulated. Rev 1035 adds basic ACC 2036 emulation. Another significant Packard Bell "first" many have had is the Legend 40xCD model as that's a cheap Pentium 75 (without cache D: ) but with a overcompensating software bundle that many out there are seemingly familiar with (mainly for Spiderman Cartoon Maker and Journeyman Project). This particular computer model was popular in the US. I've never had one but lots of my friends did. It's Hillary-based IIRC and has some kind of SB16-compatible Packard Bell-exclusive sound/modem/tuner combo card (which exists on many models from 94-96). Packard Bell PB570 (the board used on the Legend 40xCD and friends) now emulated at rev 1055. Does this motherboard have pci slots for other video cards? I'm only able to select the onboard video. Currently you can't select any other video cards on systems with built-in video. It's one of the things I need to look at improving. For the hell of it, I added the PB520r (socket 4 motherboard) at rev 1058. I think that's enough Packard Bell for now. 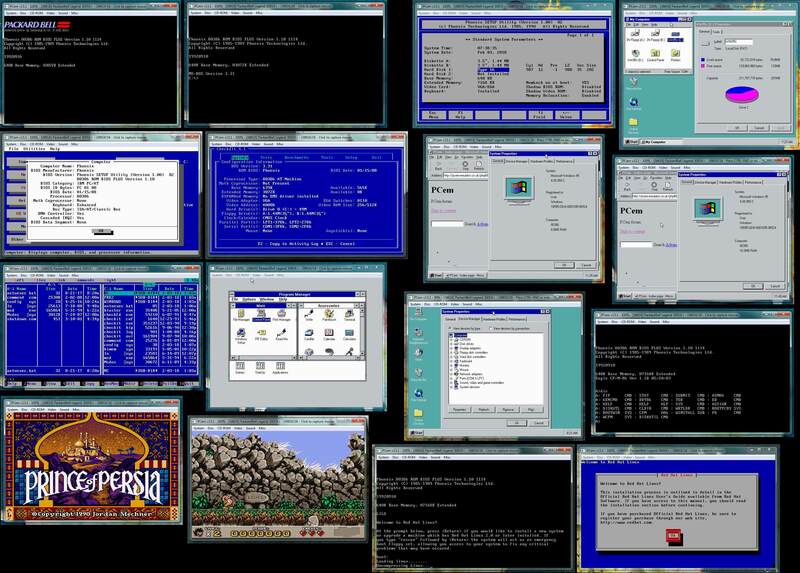 With the commits in the past week, PCem now emulates every system (sans some vgas and sound cards) that I've had contact prior to ~1996, this is wonderful. The PB520r is working perfectly with my HDD & BIOS dumps. EDIT: Just a quick note: most GD5434 were just 1MB with expansion slots for 2MB (the two of mine are 1MB, including the onboard the PB520r). PCem only allows 2MB and 4MB (the configurations with the faster memory accesses). I am using the packard bell 570 machine and no matter what soundcard or use the rtl8029as network card I get an error about a pci irq conflict. There is no way to get any of these devices to work. Am I missing something? Should be fixed in rev 1064. Thanks for the fix. Works great now. Should also add this, before anyone stumbles into it by accident! The PB570 BIOS only seems to support 2 PCI cards - the PIIX chip supports 4 devices, one of which is taken by the onboard graphics. This should leave three slots, however the BIOS seems to screw up IRQ mapping for the third slot so in practice it doesn't work. From what I can see, the real machines with this board only ever had two PCI slots so this was never an issue. For PCem, what this means is that if you had more than two PCI devices - say, an AudioPCI, a PCI network card and a Voodoo card - only two of them will actually appear to be present. This is simply a limitation of the PB570 and there isn't much I can reliably do about it. I should really add a warning about this though. For the record, all the PCI boards have limitations here - the SiS496/497 and Premiere/PCI are limited to three devices total, PB520R supports 3 devices + onboard graphics, while the Advanced/EV, Advanced/ZP and 430VX clone support four. I never had a packard bell based on a Hillary motherboard but I did have on based on the pb600. If its similar to that it required a riser card for the expansion slots. Mine had 2 isa and one pci on the riser card. I do remember borrowing on of my friends packard bell riser cards that had more pci slots and it worked on my pb600 motherboard. Sarah was the Hillary anything like that? Nope. Confusingly, PB570, 570, 590, 620, 630 and 650 are all basically the same Hillary design, with the same BIOS. PB600 is different, based on a VLSI chipset rather than an Intel one. I know they are different I just meant does the hillard board use a riser card for the expansion slots? Ok. Well if it does my pb600 which was in a Packard bell c110 had a riser card with 1 PCI slot and 2 ISA Slots. My friend had a packard bell that had a riser card that had more pci slots than the one mine had and it worked in my packard bell just fine. So would the riser card plugged in change how many pci slots the hillard could support? No - it's a limitation of both motherboard and BIOS. I keep getting a crash on pcem with the pb570 board. It happened a few times with the original merge and after the pci bus fixes. I start the machine it post but when it goes to boot it crashes. It seems to happen when certain cdrom images are mounted at boot. I get the error in the pcem log "Device failed to request command" that is the only line in the log as well. I also tried with removing any expansion cards ie soundblaster and rtl8029as. I just left the hard drive and cdrom. I can confirm that this happened to me some time ago with the install CD of a linux distro, mounted at POST = crash in various AMI bioses for Pentium. Forgot the report. When you say 'when it goes to boot' - is this before the OS is loaded? How are the boot options set in the BIOS - is the system set to boot from CD-ROM?